I n many ways the state of Bihar is unique. It is resource rich, but the people are very poor. It is a state of scams where officials and politicians have allegedly amassed great personal wealth but the state exchequer is virtually depleted. Laloo Prasad Yadav, the husband of its chief minister Rabri Devi, is a virtual demigod, even though he is allegedly involved in a multi-crore rupee fodder scam. During the recent Lok Sabha elections, as he waded through Madhepura district in search of votes, Yadav saw his vote bank eroding. The people knew that even their demigod had failed to deliver. Today, Bihar is a household name for a state where erosion of moral values and rampant corruption have eroded the environment. But few know that corruption in the management of the environment has corrupted the society. Bihar was once fertile and prosperous, the centre of many ancient Indian dynasties and the seat of culture and learning. But today all we see is discord and despair. At the root of some of the problems - poverty and corruption - that plague Bihar, lie the floods that visit it annually and a policy to see that things remain unchanged. In 1954, the state embarked upon a spree of building embankments along its major rivers. But this policy has backfired miserably. The floods that were once the harbingers of prosperity today bring disaster in their wake. A silent, suffering majority has been trapped between the embankments built by the government and the bureaucrat who is supposed to govern. The embankments have failed those who reposed trust in them as incidents of rivers breaching their embankments are reported from all over the state. Perhaps, the bureaucrat and the engineer have failed as well. The Report of the Comptroller and Auditor General of India, 1997, blames the state government squarely for this by stating that monitoring of flood protection works is inadequate. This year was no exception. It seemed almost as if everyone was waiting for a breach or disaster to take place before taking any action. And, as if to oblige them, a disaster did take place. At 11 pm on September 4, 1999, the river Kosi devoured the e -2 spur of a retired eastern embankment in Paharpur basti in Saharsa district, rendering 20 families homeless out of the 1,800 living on the embankment. The spur was a part of an older embankment, which was retired after the river had breached it in 1984. However, when the embankment had been built initially the people living near it had been relocated. When the new embankment was built after 1984 the villagers were trapped between the embankment and the river. Perforce, they sought shelter on the higher reaches of the retired bund to escape the fury of the floods. Soon they were taking shelter on the eastern embankment that had been constructed where the breach had occurred. It will not be long before they are homeless again. Lal Mohammad, the 72-year-old head of the Paharpur basti, had campaigned for the building of the embankment in his youth. Today, he blames government inaction for the disaster. "The executive engineer asked us to pray to God for help," he says. There was no money for the maintenance of a retired embankment, officials informed them. He was surprised when the officials swung into action the day following the breach. "We have already spent Rs 15 lakh on repair work," says Ashwini Kumar Sinha, executive engineer, Eastern Embankment Division, Birpur. "We will finalise a plan of action by November," he adds. Some people, however, are not surprised. Bhagwanji Pathak of Kosi Consortium, an umbrella organisation set up to fight for the flood victims living along the banks of Kosi in Saharsa, says it is a big sham. "They had been waiting for this to happen, now there is tremendous scope for further corruption. They will make a big project and divert funds from it," he adds. It seems this, is one of the methods that engineers and contractors use to create projects. The rest is juggling with figures in a manner that would leave even a seasoned accountant bewildered. But figures, too, can tell tales, says D K Mishra of the Barh Mukti Abhiyan (bma) . According to the bma, an organisation fighting for flood victims in Bihar , between 1952 and 1998 the state government spent around Rs 801 crore on flood control - most of which was spent on construction of embankments. This does not include establishment costs. The length of embankments also increased almost 22 times, from 160 kilometres (km) in 1952 to 3,465 km in 1999, no doubt a laudable effort, but the flood prone area shot up almost three times from 2.5 million hectare (mha) to 6.88 mha. The embankments were failing to deliver. Out of the Rs 801 crore, the government had spent nearly Rs 530 crore by 1989-90 on construction and maintenance of embankments. After 1990-91, the government only constructed 11 km of embankments between 1990-91 and 1998-99, but it spent around Rs 270 crore on the maintenance of the embankments alone, says Mishra ( see table: The bottomless pit ). 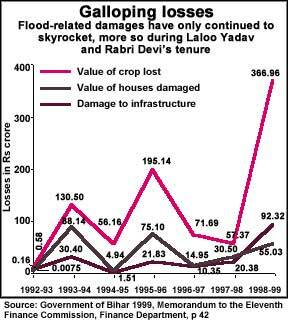 The 1999 report of the eleventh finance commission of Bihar states that flood-related damage, estimated at Rs 9.49 crore in 1989-90 rose to Rs 514.78 crore in 1998-99 - more than 54 times. Despite the failure of the embankment strategy to control floods, governments have continued to build them because of the opportunities they offer to deplete the state exchequer. One such case of a notable failure is an embankment on the river Gandak. The Pipara Piprasi embankment, as it is known, has suffered a breach again this year. Built during the 1750s the embankment has been damaged almost every year after Independence, claim people. Krishna Kumar Mahato, the district magistrate of West Champaran, who has his headquarters in Bettiah town, has just finished conducting an inquiry in the latest breach. He does not rule out the possibility of the episode being engineered by someone within the government. It might not be an isolated case. In the last 50 years, hundreds of embankments have suffered breaches all over Bihar due to poor maintenance or perhaps because funds meant for their maintenance never reached them (see box: Failing measure ). D K Mishra is one individual who believes that construction and maintenance of embankments was and is being used as an excuse to divert funds into the pockets of the corrupt. An engineer and consultant by profession, he has laun-ched the bma in Andhra Thari in Madhubani district. He relentlessly tours villages along the Kosi in Madhubani, Saharsa and Darbhanga districts trying to mobilise the people so that they can be given a fair hearing by the government. He has a very strong case. "In 1998 there were 125 incidents of embankment failures," he says, " but the government insists that the figure is only 16. It claims that most of them were zamindari embankments, built by landlords before Independence, and it is not responsible for their maintenance." Nevertheless, government officials agree that the situation has been alarming for several years. According to Radha Singh, secretary, water resources department ( wrd ), Bihar, nearly 166 people have already died in this year's floods that engulfed 21 districts and affected more than six million people in 3,550 villages. "In 1987, flood-related damages alone were to the tune of Rs 1,698.50 crore, almost equal to the annual plan outlay of the state," adds S N Jha, former engineer-in-chief, wrd , Bihar. The embankments have led to drainage congestion and imparted - in some cases - a false sense of security. Due to this people have encroached upon the flood plains. Their fields and homes are now in the area the river once flooded. When a breach takes place, a tidal wave of water is unleashed. Then the waterlogging begins. Floodwaters that normally receded after a few days now stay for weeks. The embankments now add to the misery of the people by preventing the waters from retreating (see box: Embankments ). "Earlier the floodwater used to spread over a larger area. It brought fertile silt and the people would reap a bumper crop. But now the silt is confined between embankments and when a breach occurs devastation follows. The water enters human settlements with great force," says T Prasad, director, Centre for Water Resources Studies in Patna University. Condemning the policy of having built embankments in such a reckless manner, Shradhanand, a journalist from Nauhatta in Saharsa, a district impoverished by prolonged waterlogging, very simply tries to explain how the nature of the floods has changed. "The flood was earlier akin to a cat in its behaviour," he says, "it would come and go stealthily and swiftly, melting back into the river. Now it behaves like a tiger, coming with a roar, destroying at will and staying for much longer periods" (see graph: Galloping losses). There was a time when engineers were not keen to push such projects. Before Independence, in November 1937, G F Hall, the then chief engineer of Bihar, had sounded a warning against construction projects: "As my knowledge of flood conditions increased, I began to doubt the efficacy of bunds and gradually came to the conclusion that not only was flood prevention undesirable but that bunds are the primary cause of excessive flooding. North Bihar needs floods, not flood prevention." Hall also feared that the way bunds were being constructed engineers were "storing up a disaster for the future," though they may not be around to witness its climax. By now it is well known that embankments exacerbate the intensity of floods. However, the multiplying costs of construction and repair have built up a politician-engineer-contractor nexus. These people share a strong vested interest in "development" projects, particularly since embankments can get washed away in the floods. In this scenario it is impossible to even hope that alternative flood control policies will be seriously discussed. There is so much money in what is happening now. How and why did the rivers curse Bihar? It all began with a group of young politicians in the 1950s. To them goes the credit for pushing the idea of building embankments. This was done in the name of trying to tame the rivers of the state. In the 200 years between 1736 and 1936, the Kosi migrated almost 120 km westward of Purnea to meet Lalit Narain Mishra, a young politician, near his village, Balua. The plains of North Bihar are drained by an extensive network of 13 rivers that, like the Kosi, meander through the plains they have helped create over millions of years (see box: The roaming rivers ). However, with Lalit Narain Mishra it was different. He took flood control measures to be his mission in life. Perhaps he hoped that he would manage to rid the state of floods. Some people in Bihar insist, he did it in the hope of making money. Mishra was a very successful politician. He would later hold several cabinet posts. His last portfolio was that of Union railways minister. In 1953, when the floods came, a hasty two-day whirlwind tour of prime minister Jawaharlal Nehru was put together from August 12, on the insistence of Lalit Narain Mishra, Hari Nath Mishra and S N Agarwal of the Congress. A case for embanking the Kosi was pushed and lobbied for with great vehemence, says D K Mishra. The Union government set up a team of experts comprising K L Rao, an engineer who later became the Union irrigation minister, and Kanwar Sain, vice-chairperson of the Central Water and Power Commission. The team was sent to China in May 1954 to study the flood control works carried out on the Yellow river or Hwang Ho. It was recommended that the Kosi be embanked to control floods. At this point it was forgotten that the Yellow river had frequently broken its embankments. There were terrible floods in China in 1933, which had led to 50 breaches affecting 3.6 million people and inundating 11,000 sq km. In the 100 years between 1855 and 1955, the embankments had failed on more than 200 occasions. It is not surprising today that there is not a single embankment on the Kosi that has not suffered a breach. Questions have always been raised regarding the soundness of this decision. "The decision to embank the Kosi was a political one necessitated by extra-technical considerations. The entire debate on flood control techniques, which was going on since the construction and subsequent demolition of the Damodar embankments in the 1850s, was thrown to the winds," says Mishra (see box: The Damodar blunder) . "What is also amazing is that the plan to embank the Kosi was approved even before the experts' committee was set up. Since the Kosi embankment plan was approved by the Union government in December 1953 and the experts sent to China in May 1954, they already knew what they had to recommend," he adds. Resistance came in the form of a people's movement and from official quarters. Rai Bahadur A C Chatterjee, the then chief engineer of Bettiah Raj (West Champaran), at a meeting held on November 20, 1954 under the chairpersonship of Sri Krishna Sinha, the then chief minister of Bihar, opposed the proposal. Parmeshwar Kunwar, a freedom fighter, was arrested and sent to jail in October 1954 for protesting in front of the president of India, Rajendra Prasad, during a public meeting. Later Kunwar became so popular that he was elected four times to the legislative assembly (1957-77) from Mahisi constituency in Saharsa district. Even elsewhere people were up in arms. A plan to raise embankments along the river Kamla was opposed under the leadership of Ram Parikshan Pandey of village Pirhi, in the Babu Barhi block of Madhubani district. The people feared that the embankments would impede drainage, create waterlogging and deprive the area of the fertile silt. The movement succeeded in keeping 13 km of the Kamla unfettered by embankments. But all this did not deter politicians. An organisation known as Bharat Sevak Samaj ( bss ), had already been set up in 1952 by national leaders, social workers and many eminent persons. Names like Jawaharlal Nehru, Gulzari Lal Nanda and Abul Kalam Azad could be found on its national committee. When the plan to build embankments received the green signal, L N Mishra decided to use the bss to do this work. It was agreed upon that the embankment would be built using shramdan (voluntary labour). 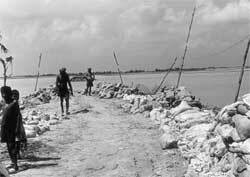 Bihar's chief minister Sri Krishna Sinha laid the foundation of the embankment on the Kosi river on January 14, 1955, in Nirmali, Saharsa district. According to Ramchandra Khan, inspector general of police (prosecution), Patna: "Senior politicians used this opportunity to award projects to their close relatives, one of the contractors was Shyam Mishra alias Ladoo Babu, a relative of L NMishra." " Aur dekhte hi dekhte Balua, balu ke paise se ban gaya (Within no time Balua, Mishra's village became rich, its riches coming from money raised through the shifting of sand)," says Pathak of Kosi Consortium. Initially, the bss was passing on the work to gram panchayats and involving local people in shramdan . Contractors eager to bag earthwork projects found they were unable to compete with it as it was undertaking the work at very low rates. The contractors required to save more money (sometimes around 30 per cent of the cost of the projects) in order to give commissions to engineers, bureaucrats and politicians. Huge tempting sums of money were changing hands just to shift sand from one place to another. There was immense scope for corruption in such projects. Soon engineers started delaying bss work, says Hemant, a senior journalist with Hindustan, a Patna-based newspaper. The day came when bss had to admit that it couldn't function anymore in such adverse circumstances. Even as the bss pulled out, there was a sudden increase in the allocation of funds for embankment construction. Soon the budgetary allocation for embankments increased by 60-70 per cent and in some cases even went up by 100 per cent, adds Hemant. "Later, senior government officials invited the bss to take up more projects. But by then charges of corruption were being levelled against the bss workers," writes Hemant in his book Jab Nadi Bandhi . "One of the charges levelled against them was that they were exploiting people in the name of voluntary work. Soon it also became apparent that almost all the contractors being awarded work by the bss were relatives of politicians," alleges Kunwar. "Gradually, the bss began to be run by Congress party workers. With this, the organisation set up to fight corruption became a source of corruption. In fact, funding for the Congress started coming from this organisation," adds Kunwar. As a result of the charges of misappropriating funds against the bss , the then chief minister of Bihar, Binodanand Jha, was forced to write a letter (number 2753) on November 3, 1961 to the convenor of the bss , Swami Harinarayananand, requesting him to open bss 's accounts to public scrutiny. However, the Swami rejected this and sent a reply (letter no bss 4468/61 dated November 6, 1961) saying the " bss was a non-political and non-governmental organisation whose sole motive is to build the nation and work for social justice. The bss is already getting its funds audited by an independent agency and thus there was no need to get its accounts audited by a government agency." A copy of Jha's letter was also sent to L N Mishra. He replied on November 9, 1961 saying,"it is wrong to think that the bss ' fund is a government fund by any means. bss is solely responsible for earning this money." Finally, a committee was constituted under a retired judge of the Supreme Court, J L Kapoor on February 27, 1968. Five years later in 1973 it published its report but failed to reach a conclusion, as it could not get hold of documents relating to expenses incurred by bss . In between, when Karpoori Thakur became the chief minister his government constituted another committee under K K Dutta, a retired Judge of the Patna High Court on May 26, 1971. However, the committee was scrapped on July 14, 1971, when a Congress government came to power under the chief ministership of Kedar Pandey. This was done on the excuse that the Prime Minister's permission was not sought before setting up an inquiry against a cabinet minister (L N Mishra) involved in the scam, as required by the "code of conduct". D K Mishra writes in his book Barh se trasta, sichai se pasta, uttar Bihar ki vyatha katha, "according to the code of conduct 1964, regarding cabinet ministers, a state government must have prior permission from the prime minister before constituting any inquiry against a cabinet minister." L N Mishra was a cabinet minister even when the notice for constituting the Dutta committee was issued on May 26, 1971. Even at that stage the permission had not been sought. In his book Jab nadi bandhi, Hemant of Hindustan, writes: "Embezzling money to the tune of Rs 2.10 lakh in 1959-60 from the bss 's funds was one of the charges levelled at Mishra. Even when charges of corruption against bss started appearing in the media, L N Mishra did not make the accounts public." Hemant also alleges that 109 of bss team leaders did not execute their work even after taking money in advance from the government. About 389 team leaders did not return the money they received in excess, he adds. The Public Accounts Committee of the third Bihar Assembly (1962-67) reported in its 10th report that a chief engineer of Kosi Project was found indulging in apparent mismanagement. In his defence, he is said to have stated that he had the prior consent of the prime minister for his actions. This was later found to be incorrect. It is well-known that it is very easy to siphon off funds from earthwork projects, says D K Mishra. Perhaps this was the reason why politicians in the 1950s pushed hard for embankments to be built along rivers in Bihar. The money siphoned off from such projects was used to fund political activity, alleges Hemant. " Uttar Bihar me agar barh na aye to poore Bihar ke rajniti me sookha pad jata tha" (If floods did not visit north Bihar, there would be a drought in Bihar politics), he says. Embankment projects are so lucrative that it even forces politicians from the same parties to raise their voice against each other, says Ranjeev, a resident of Patna. "Building embankments is a safe way to be corrupt," says Vishwa Ranjan, chief of Intelligence Bureau, Patna, Bihar. "There are so many loopholes that they can be easily exploited," he points out. However, politicians did not realise that they had opened up a Pandora's box.They failed to foresee that corruption in the management of the environment would eventually corrupt the entire society and place the funding of political activity in the hands of criminals. It was not long before criminals followed contractors into the lucrative activity of building and repairing embankments. Ranjeev makes a startling disclosure. "Nearly 25 per cent of the people living in Gangajali Muhalla in Saharsa district are contractors who have constructed their houses using bricks taken from the Kosi project," he alleges. Today, criminals have taken control of the contracts given for construction of embankments. They have also become fund-raisers for political parties, politicians and the rulers of the state. As the Bihar government is now short of funds, it has shelved plans to build embankments. At present, the state government is concentrating only on maintenance of the existing structures. Surprisingly, when he came to power, Laloo Prasad Yadav, ordered that the maintenance of earthworks would be done by the government. From 1990 to 1999, the government spent around Rs 270 crore on this alone. Flood-related damages also skyrocketed during this period. Shradhanand, formerly a journalist from Aryavrata, a Hindi newspaper published from Patna, lives in Nauhatta, a small town in Saharsa district. He alleges that most contractors have criminal cases pending against them. Politicians and engineers, who began the work on the embankments, were fully aware of the cost of projects and the heavy cuts involved in earthworks. "L N Mishra was the main fund-raiser for his party," says Ajit Kumar Jha, resident editor of The Times of India , Patna. Ramchandra Khan, inspector general of police (prosecution), Patna, feels that the primary work of the bss was to get contracts by bribing engineers, distribute the work and take a commission. It was only a matter of time when this would erode the moral fabric of society and that of the officials who obeyed those who ran the government. The bureaucracy in Bihar was submerged and overwhelmed by this deluge, which brought in its wake a flood of opportunity to make money, he says. The malaise is deep-rooted today. The 1997 report of the Comptroller and Auditor General ( cag ) of India, questions many of the practices involved in flood control measures. For instance, during 1992-96, the maintenance of embankments before the flood season was not adequate as per the recommendation of technical advisory committees. "In disregard of the departmental orders, anti-erosion flood fighting works (mainly maintenance of embankments), valued at Rs 39.05 lakh, were done on the basis of handwritten receipts from 1992-93 to 1996-97 in four divisions. These were the flood control division Thakraha, eastern embankment division Birpur, flood control division 1 and 3 Madhubani at Padrauna," says the report. According to a Housing and Urban Development Corporation official at Patna, corruption is so rampant in the system that some bureaucrats are apprehensive of coming up with projects as they fear that politicians may immediately demand a 40 per cent cut. And since the cut is so high, contractors manage to get paid even without executing any work, all they do is give the cut in advance. The project is thus executed on paper. For example, the cag report states that the "supply of 7,673.7 cubic metres of boulders (valued at Rs 31.98 lakh) at Nehru Park (Nepal) in the Birpur Division was doubtful, as there was no evidence of it being lifted from the quarries." Further, despite an expenditure of Rs 36.13 crore on two drainage schemes in the Gandak and Kosi command areas, no submerged area was rid of waterlogging. The amount was mainly spent on establishment costs of two drainage schemes. Sometimes, engineers and contractors create projects. In normal cases, engineers are supposed to submit a plan before starting a project. The technical advisory committees and other high-level committees from the Flood Control Department visit the site where the work is to be executed. They review the plan and then give clearance for the project. Thereafter, the government notifies the plan and the work starts, says Ashwini Kumar Sinha, executive engineer, Eastern Embankment Division, Birpur. Then it is possible to start the loot of government resources in the name of construction and maintenance of embankments. The supply of boulders has tremendous potential for corruption. "Sometimes, contractors show on paper that they have delivered boulders at the site, and get their payments," says Vijay Babara, a journalist from Nauhatta. In some areas of the Kosi region, contractors are in cahoots with criminals, says Shradhanand. After the contractors deposit the construction material at the site, these criminals come in boats and decamp with it. Later, the same material is delivered to another site for some other project, adds Babara. In certain circumstances, engineers make money by compromising on quality and quantity of raw materials. Sometimes they forge bills and make payments for material which has not been supplied. Says Shradhanand, "Contractors and engineers keep only 15-20 sandbags in a nylon crating, which is used to bolster the embankment instead of a minimum of 25. They show that the other bags have been washed away by the river." "In the past, the government initiated several probes against engineers. But these have proved futile. No action is taken in most cases," says S N Jha, former engineer-in-chief, wrd , Bihar. "Contractors and engineers can also make money while raising the height of embankments by piling on loose earth or getting funds passed for projects that have not been executed at all." Embankments, however, are not the only source of making money today. The loot of the state treasury has started taking place on all fronts. As a result, several former ministers and two former chief ministers -- Jagannath Mishra and Laloo Prasad Yadav -- stand accused by the cbi in the infamous fodder scam (see box: Facing charges ). The joint director of Central Bureau of Investigation ( cbi), U N Biswas, is of the view that the money generated by politicians in the fodder scam helped Laloo Yadav to come to power. The practice of corruption which was initiated during the 1950s has today become institutionalised in Bihar. Politicians have created a Frankenstein they can no longer control. This north Indian state is today a land of paradoxes. It is known both for its mineral wealth and its abysmally poor people. Here we can find corrupt bureaucrats, flushed with funds and personal wealth and a state as deprived of money as the poor who eke out a miserable existence in its villages. The poverty is very visible particularly in those villages that have the misfortune of being close to or located in the flood plains of the many rivers, which spread a serpentine network over the resource-rich lands of the poor farmers. Bihar is also known as the state of rapacious appetites and extreme penury. Here a politician can gobble up Rs 500 crore in a jiffy, and a chicken in a state run farm can consume 50 kilogrammes of feed in a day. Even buffaloes have been known to be miserly and ride pillion on scooters during the height of the fodder scam.It is appalling how these funds have managed to line the pockets of senior politicians and increase their personal wealth. Are there more scams lurking in the background? The victims of the original scam, the Kosi Project, can be found everywhere today. They are either dreaded criminals or landless workers (see box: Eyeless in Bihar ). They ride rooftop on trains, migrating to Punjab and Haryana in search of jobs or farmland to till, as their own has been swallowed up by embankment-induced waterlogging. Others can be found eking out a miserable existence in the state itself. In Saharsa and Supaul districts, more than half a million people have been living in sub-human conditions for years. According to Lal Mohammed, head of the Paharpur basti , situated on the Kosi retired embankment, "Most of the people have gone to Punjab and other states of India, even Nepal, in search of jobs. We supported the construction of embankment in 1950s. That was a big mistake on our part. Today, we are paying a heavy price for it." "When the government started constructing embankments, we opposed the idea. We knew that the area will become permanently waterlogged. Whatever we predicted in those days is becoming a reality today," says Kunwar. Devnarayan Yadav of Sorbazar in Saharsa district, says, "Embankments have proved to be more destructive than we had imagined. My fertile agricultural land is now in the Kosi river. I regret supporting construction of embankments in the 1950s." "We call ourselves the victims of the Kosi project," says Bhagwanji Pathak. And they are more than justified in saying so. A stretch of around 3 km to 5 km on the eastern side of the eastern Kosi embankment (from Bhimnagar to Koparia) is permanently waterlogged. Rainwater and seepage from the embankments is primarily responsible for this. This has destroyed farmland and led to the rise of several diseases. "The area has an acute drinking water crisis. Tuberculosis, kala-azar and malaria have become common. Kala-azar was very rare in this region, but from 1978 onwards it has spread alarmingly," says Bashi Kant Choudhary of Saharsa town. Jagdanand Singh, the present minister of water resources in Bihar, had stated at public meetings in 1993, that "his government did not participate in construction of embankments along the rivers as it was aware of the disastrous consequences". However, from 1991 onwards the annual reports of the water resources department in Bihar provide data which contradicts this statement. According to the reports: "Ten embankment schemes are still under construction. The total proposed length is 872.74 km and the area to benefit is around 0.63 million hectares. Only 556 km of embankments have been constructed so far, which has given protection to around 0.32 million hectares. It is getting difficult to complete these schemes because of paucity of funds." The new paradigm of flood control being proposed by officials today is faulty. To begin with it envisages the setting up of a dam in Nepal, an area noted for seismic activity which would be linked with the embankments in the state. This could merely increase the scope for further corruption. On April 6, 1947, C H Bhabha, member, ministry of works and power, government of India, proposed the construction of a large dam with 0.31 million cubic metres (mcum) of water storage capacity at Barahkshetra in Nepal's Chatra valley at a cost of Rs 100 crore. It was also to generate 1,200 megawatts of power and its canal system would irrigate 1.25 mha of land in Nepal and India. However, on June 5, 1951, the Union government constituted a committee, chaired by S C Majumdar, advisor engineer, Government of West Bengal. This committee scrapped the project on the grounds that the power generated by the project will remain unutilised. Environmentalists, too, opposed the building of the dam because of the site being earthquake-prone. Government officials, however, maintain that the dam is the only solution to the problem. The government of Nepal has not responded enthusiastically. It says that the proposed site is located too close to the epicentre of an earlier major earthquake (see interview: No one in the world can manage floods better than us ). In 1987, when the floods occurred, the then chief minister, Bindeshwari Dubey, put the blame on Nepal. Journalist Kuldip Nayar while writing in The Tribune in Chandigarh quoted Dubey as saying, "Nepal does not allow us to install warning devices." The expert committees that were set up during that period recommended a further elevation of the existing embankment. The government said that till the time big dams come up in the Nepal Himalaya, it will be forced to stick to embankment construction as a measure to control floods. Mishra says: "The dam cannot control floods for the simple reason that the location of the site is not proper." The Kosi has a catchment area of about 59,000 sq km. Of this, 14,000 sq km is located below this proposed dam. This equals the catchment area of the Baghmati river over which the dam will have no impact whatsoever. A similar quantity of water still flows outside the Kosi embankments and causes acute waterlogging. If the embankments remain intact, the situation within the embankments, too, will not change. Further, it will require around Rs 40,000 crore today to build this dam. "The state government would find it really tough to repay the loan taken from various international funding agencies, including the World Bank," he says. However, T Prasad, director, Centre for Water Resources Studies, Patna, opines: "If the dam is constructed, and the water resources are properly managed, farm income and employment will increase by 15 times." So it would not be wise to rule out the possibility of a dam without conducting a feasibility study, he adds. It cannot be said for sure that there is any paradigm for flood control. Perhaps the best alternative is to try and learn to live with floods as people did traditionally. "Even after 40 years, we are ready to live with the same river. We don't want these embankments," says Khan. However, one thing is definite. The construction of embank-ments corrupted society in Bihar. The state is a unique case study of how poor environmental management, especially one which emphasises construction, leads to corruption which may be difficult to get rid of, especially if it gets interwined with the local political culture. The floods were welcomed traditionally. When they came there was gold in the silt the rivers brought with them. A bumper crop followed and the people were prosperous. Today the gold is in the files some babus of Bihar hold close to their chest. Files that hold contracts to carry out flood control works. The people are caught between the embankments and the bureaucracy. And there seems to be no respite.